42 Ft. Sail Boat, in quiet protected marina. We are ready to provide you with a unique and great place to stay in the Keys. 5 star reviews! Very clean and spacious 42 ft Catalina. 3 berths, sleeps six, large galley, 2 toilets. Master berth has private door and is very private. In a paradise location, quiet private Marina with friendly neighbors. Plenty of room to swim right off the back of the boat in crystal clear water. Occasional appearances by manatees. Minutes to state beaches, tennis courts, full sized public swimming pool, shopping, restaurants and attractions. Nearby by wild bird sanctuary and bird rescue facility open to the public. Theater of the Sea offers swimming with dophins in a natural environment. 1 hr from Miami, 80 min from Ft. Lauderdale. Close to local car rental. If you are looking for a worry free relaxing vacation you can't beat this amazing setting in a clean and friendly marina. You will LIKE it here! toilet, Full shower facilities are steps away in the marina. The marina has bathrooms and showers. Pots and Frying pans, Microwave bowls. Swim right from the back of the boat in a protected marina. From the moment we found the Northern Cross rental on Homeaway New Year’s Day, to the communications leading up to and during our stay, to the very last minute we were leaving the parking lot to return home … everything we imagined came true and then some! The “live aboard” experience was exactly as advertised. And, having Captain Paul as our “tour guide” was beyond our wildest dreams … Fishing, Snorkeling, Sunset Sailing, Exploring the Mangroves, and Feeding the Tarpon at Robbie’s. We had great seafood meals and entertainment at Snapper’s, Lorelei, Lazy Days, Wahoo’s, and Hog Heaven, all at Captain Paul’s recommendation. The location was perfect to charter for a day of Deep Sea fishing out of Islamorada. And, we made it into Key West for a Jet Ski tour, History lessons, Tropical drinks, “Half Shells” and Hot Dogs at “Island Dogs”. We were “Lucky Enough” to experience a lifetime of memories in our week spent on the Northern Cross “Living on Blue Waters”. Thank you Rick, Tony, and Captain Paul for sharing your boats and love of the Florida Keys with this Father, Son, Uncle and Aunt. Thanks for your great review. Living on our boat is more than just a place to stay. It is also an experience including all the on-the-water opportunities you listed. 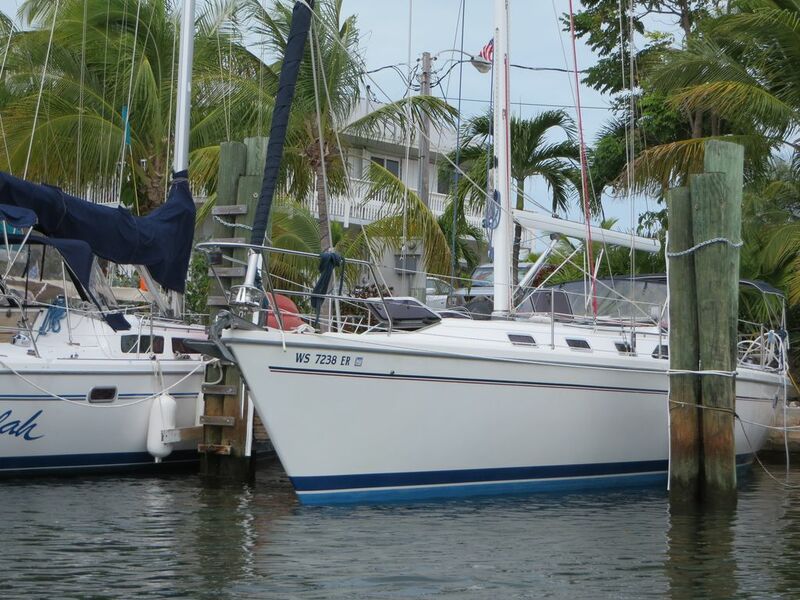 Captain Paul loves taking people out and sharing his enthusiasm for the “Keys way of life”. Beyond that are world class restaurants many of which boast spectacular sunsets. Still looking for more, the Keys are waiting! Enjoyed our stay on Northern Cross - owner and Molly communicated well, comfortable accommodations w three adults, friendly marina owner and neighbors. Ate mostly at restaurants not on board, liked Moka cafe and Lorelei nearby. Saw baby dolphin at marina - saw manatees and tarpon at Key West, nice Harry Harris park nearby for bike riding, beaching, beautiful Bahia state park past Marathon. Would have given five stars but significant urine odor on boat, opened hatches to air out but seemed to linger. Owner was very understanding and said he would resolve the issue. Glad to hear you enjoyed your stay in the Keys. Thanks for letting us know about the odor you noticed. The problem arose from a fuse that blew and prevented the electric-powered toilet from flushing properly. It has now been corrected and our two managers tell us there is no longer a problem. Your feedback allowed us to correct this issue promptly. By the way, we take many steps to avoid odors on the boat including 1) a weekly pump out of the holding tank, 2) providing holding tank deodorizer for our guests, and 3) doing a "shock" deodorizer treatment of the holding tank 4 times a year instead of the recommended once a year treatment. We take pride in the condition of our boat! Our stay on the Northern Cross was fantastic! The boat was spotless, and the beautiful interior was very comfortable. Captain Paul, the property manager, was very helpful and I had a great day fishing with him. He put me on three huge Tarpon on the flats, but even with his great poling and my best casting, we couldn't get a hook up. We even rescued a boater who fell off his boat in the mangrove swamps! The marina folks were very nice and friendly...they even invited us for happy hour. One of the live-aboards, Captain Mickey, invited me to fish with him and some other boaters just 15 minutes after meeting him. We caught a lot of fish and cooked up our catch for everyone. Owners Rick and Tony were in touch with my wife and I to assure that everything was okay with the boat. Just remember...it's a sailboat and space is at a premium, so don't overpack. This is a five star rental. My husband and I spent a memorable week aboard the Northern Cross. We felt welcomed and well taken care of from the moment we booked our trip until we returned home. The communication with owners, Rick and Tony was the best I’ve ever experienced booking through VRBO. Our host, Captain Paul reached out to us through email before we left home, and texts after we arrived in Miami to make sure he was there for our arrival. He helped us settle in and feel comfortable on the boat and around the marina. His recommendations for places to eat, things to do, etc. were ALL GOOD! Besides going out for lunch (Lorelei, Lazy Days, Wahoo’s, Snappers) we spent most of our time on the boat watching the sunrise and sunset, stargazing, birdwatching and swimming. We were thrilled on one morning to have a visit from a manatee! Our stay on Northern Cross was a wonderful experience. We had a great time relaxing on deck watching the sunsets and catching a sunrise. The interior of the boat was spacious, well equipped kitchen and comfortable main bedroom. The tiki bar area was excellent for gathering to meet new friends and share stories. We were welcomed by Capt Paul and received an orientation to the boat. Gerry the marina owner was helpful and easily available. We met the Bounty Hunter, Micky and his wife and enjoyed a boat ride with our friends. We are pleased to recommend Northern Cross and look forward to a return trip. Thank you Mike and Shirley from Toronto, Canada. Children under 12 only accepted after approval by owners. No Pets. Non-smoking anywhere on the boat including cockpit and deck. Marina rules also include no smoking on the grounds of the marina.